April 19, 2013 Sean M. MartinsonLeave a Comment on Attendance Matters! 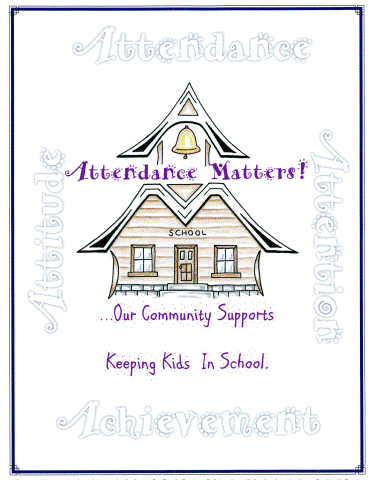 A Call to Action….Attendance Matters! On April 21st -27th, the Itasca County Truancy Prevention Program, ICTPP, will be holding their 2nd annual community campaign entitled Attendance Matters! at all four school districts located in Itasca County. This community wide campaign is brought to you by the Itasca County Family Services Collaborative with grant funding from the Itasca County Health Fund. The attendance awareness campaign tackles the issue of daily consistent school attendance. The great news is that most kids in Itasca County attend school daily. However, we do have students who struggle for a variety of reason with daily consistent school attendance. Truancy is defined by MN state statue as missing 7 or more days in Elementary school without valid excuse and 7 or more class periods without valid excuse for middle or high school students. Chronic Absenteeism is defined in Itasca County as a student who misses more than 11 days or 11 periods of the same class within a semester of school. Truancy prevention workers are located in all Itasca County schools and address the issues of truancy and chronic absenteeism. Research shows that chronic absenteeism at any age and as early as Kindergarten, is the strongest predictor of continuing struggles with school attendance. School attendance directly effects academic success. Daily school attendance is a learned behavior and as early as pre-school, students need to be building good habits surrounding school attendance. Students can fall behind in school, even if they only miss a few days every few weeks. Within the ICTPP we are able to track data to identify the students who are struggling with absenteeism. This allows for the opportunity to partner with parents, caregivers, and the community at large to find ways to connect or re-connect those students with their school community which in itself is a protective factor. Once the pattern of absenteeism is started it can be a difficult and lengthy process to correct. Often times, poor school attendance is the first indicator that a student may be struggling and in need of assistance. The partnering of many agencies in Itasca County to educate, foster a helping relationship, and provide needed services to these students and their families is creative, innovative and unique in the state of Minnesota. Search Institute has identified 40 Developmental Assets that are needed to make all youth successful in not only their academic careers but in developing needed life skills for their future endeavors. At the core of the Developmental Assets is that of a trusted relationship with a caring adult. As the saying goes “it takes a village to raise a child” and your encouragement for that student may be the difference in them dropping out or graduating from school! As the Itasca Area Initiative for Student Success indicates, “student success is the cornerstone for community success”. Our community supports keeping kids in school. Attendance Matters! Kim Geislinger, Program Director, Ross Resources, Ltd.